Some weeks ago, in a discussion with a colleague we tried to put into context whether the A380 sales were such a dismal or not. 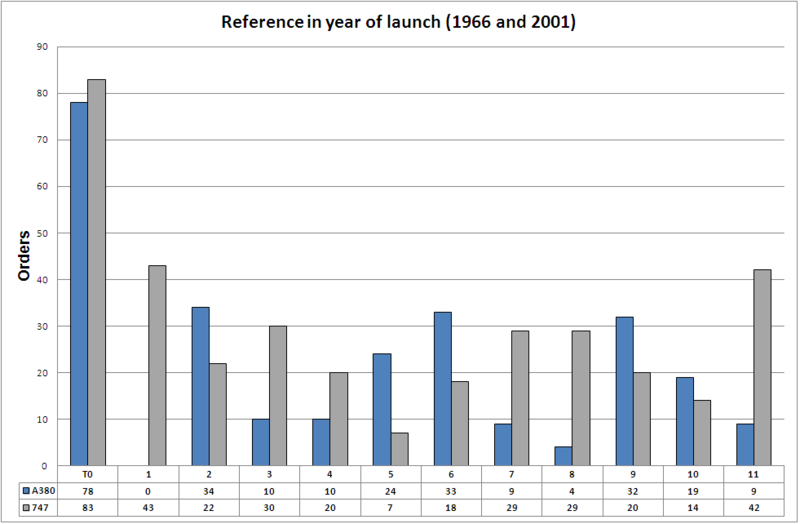 A380 and 747 orders referenced to the year of launch of each program. Thus, we can see that the Boeing 747 was selling better already from the beginning of the program. 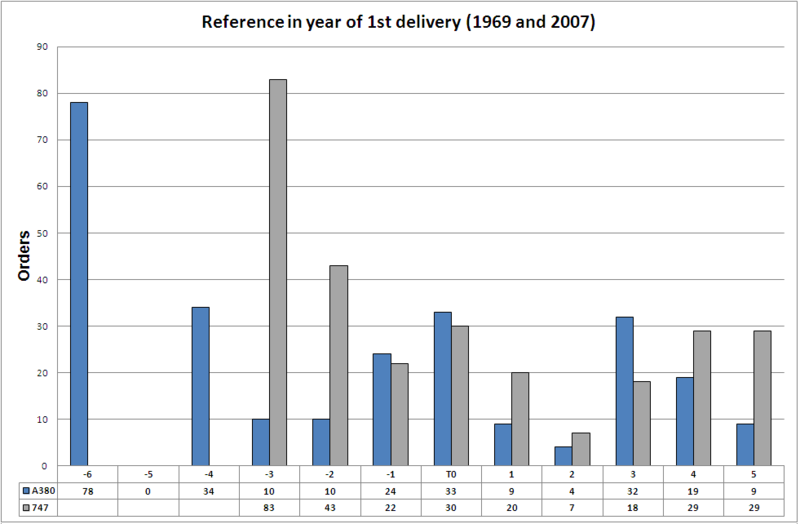 A380 and 747 orders referenced to the year the 1st aircraft delivery of each program. You can see that still, 5 years after the 1st delivery of each aircraft (2007 for the A380 and 1969 for the 747) Boeing had sold more aircraft, but with this reference the margin is lower, 19 aircraft. Boeing 747. The Boeing 747 was the first wide-body in commercial aircraft history and still is the twin-aisle with the highest amount of aircraft sold (1,528 a/c as of today, probably to be soon overtaken by the 777) and delivered (1,464 a/c as of today). However, it has taken over 40 years to reach those numbers. The 1,000th unit sold was reached after 25 years of sales in 1990. 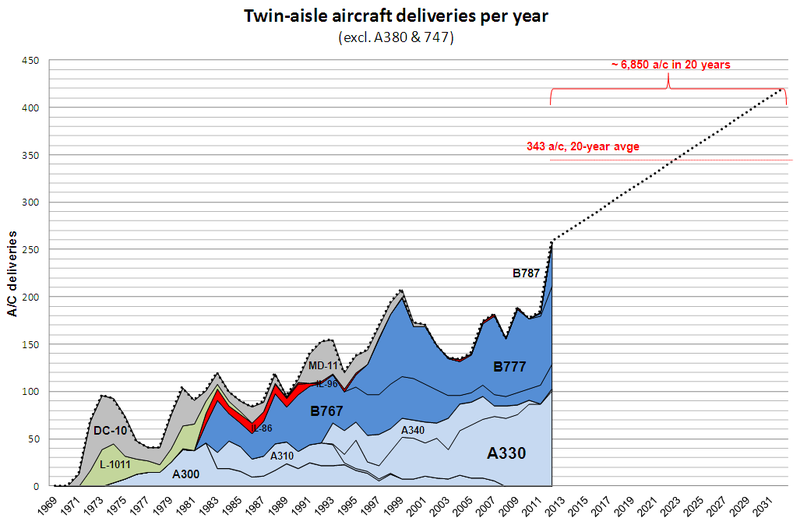 The 1,000th unit delivered was also reached after 25 years of aircraft deliveries, in 1993.
and then see what could be expected market share for the A380 against those forecasts and whether it is getting the orders to reach it or not. You can find orders and deliveries figures in both manufacturers websites or summarized here: A380 and 747.